Many customers want their money back after dozens of deer meat spoiled at a Peculiar meat company. The business said their cooler malfunctioned last week. PECULIAR, Mo. 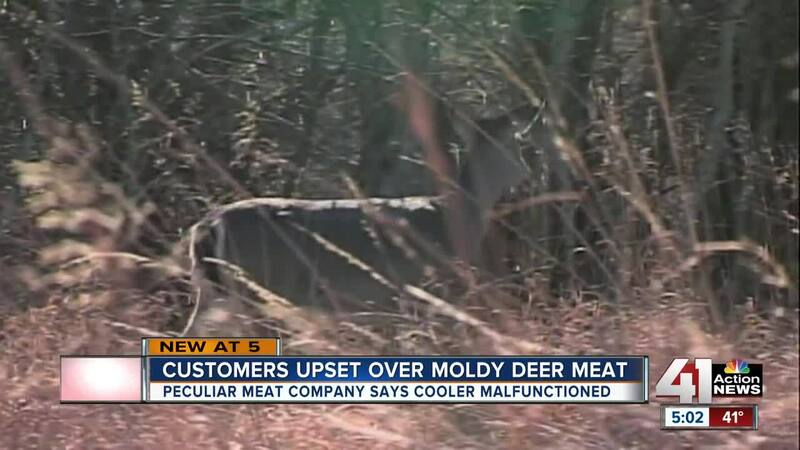 -- Dozens of people are complaining about spoiled deer meat after taking it to Peculiar Meat Company for processing. "It was white, fuzzy mold. It wasn't like a dry-aged mold, it was moisture type mold. It was bad issue type mold," said Shane Barnett, one of the business's customers. Barnett took the first buck he'd ever harvested to the business three weeks ago because he didn't have time to do it himself. 41 Action News spoke over the phone with someone from the business, who said the company currently is non-operational, but that they're working to fix the issues. Barnett and other customers wondered if they'll ever be reimbursed. The business said in a statement on Facebook that one of their coolers malfunctioned last week. "They offered to cut the mold off and process the rest and said that it was probably still salvageable, no one had gotten sick yet. Obviously, that didn't settle well with me. I have a wife and two kids so I was a bit frustrated looking at I was going to be out 80 or 90 pounds of meat," Barnett said. Barnett paid a $75 deposit and $17 for the deer tag. Other people told 41 Action News they also paid the $75 deposit plus the $95 processing fee just to go home and unwrap spoiled meat. Barnett said the business offered him either $75 in meat for reimbursement or they could give him his $75 at a later time because they didn't have the cash on-hand. "I told them that I wanted 40 pounds of ground beef, which I consider to be more than fair considering I would be out 90 pounds of venison," said Barnett. The store denied his request. He took to social media to air out his concerns, and the post has gotten hundreds of comments and shares. "We had a cooler mechanical failure last week we corrected the problem and have taken measures so it doesn’t happen again. This week we have been inspected by the Cass County Heath Department and passed with zero violations. We have also been inspected by the Missouri Department of Agriculture, and the Missouri Department of Conservation. We are following the directions of the Missouri Department of Agriculture and the Department of Conservation as to how this is handled. We have submitted this to our insurance company and are awaiting a response. It is an unfortunate situation but it happen. We thank you for your understanding and we apologize to our customers that have been effected and are working with all of them involved to get it resolved. This issue does not effect our retail area as those areas run on a different compressor. If you have any questions please feel free to call the store and talk to Dan during business hours and he would be happy to answer them at 816-779-6328. Thank you." The Cass County Health Department told 41 Action News it has no regulatory authority over deer processing and that it's the Department of Agriculture's investigation. The health department received at least one complaint. When an inspector went to the business, the coolers were at the right temperature, 41 degrees or below. The health department told the owners to clean out the coolers and separate the bad meat from the other inventory. The state told the business to throw away the bad meat and sanitize everything. The deer set aside for the Share the Harvest program were also disposed of as a precaution. "That's 150 plus deer. Probably more. They died in vain and they served no purpose. As hunters, that's a big deal. A big deal. One hundred fifty deer that should have served a purpose of feeding families," Barnett said. Barnett said when he went into the business over the weekend, he noticed his deer was still hanging whole on the hook. A worker told Barnett they'd fallen behind because of the number of orders and they'd shut down for a couple days when the weather was bad two weeks back. Barnett and other customers wonder if that played a part in the meat spoiling. "Like I told them, if they couldn't put out the deer in a proper timeframe to where people were going to get safe, quality meat, then don’t fix up the business that you can’t do. And don’t accept the money to do it," said Barnett. The Missouri Department of Agriculture hadn't gotten back to 41 Action News at the time this story was published. At least one customer told 41 Action News they had their $75 deposit returned.